This is an eight-sentence CHALLENGING grammar translation incorporating all three grammar concepts presented in Realidades 2, Chapter 2B. 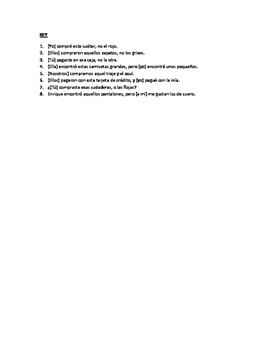 Each sentence requires students to use a preterite verb, a demonstrative adjective, AND to use an adjective as a noun. Ex. : They bought those shoes (way over there), not the gray ones. --> Ellos compraron aquellos zapatos, no los grises. 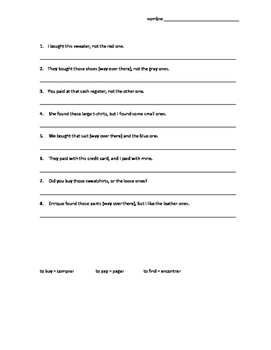 Although it is only eight sentences, it typically takes my students 15-20 minutes to complete because of the difficulty level and the multiple steps contained within each sentence. Probably best suited to an honors or higher-level class. Great as an in-class practice, a review, or a homework assignment.